Mediterranean Einkorn Pasta | Naturally.Mediterranean Einkorn Pasta | Naturally. This is a wonderful, hearty pasta dish that is perfect for a main vegetarian pasta dish that isn’t too heavy. While the pasta takes a bit of time to make, I think it is well worth it. Of course, you can always use store bought pasta which means you could then make this pasta dish in about 15 minutes. In a food processor, combine 2 cups flour, salt, and eggs. Pulse until mixture comes together and forms a begins to form a ball, 20 to 60 seconds. Add a tablespoon or two of water if the dough looks too try or add a bit more flour if the dough is sticky (if it’s tacky- that’s fine, you will add flour as you roll it out.) If you don’t have a food process, combine ingredients in a bowl and stir until dough comes together, ditching the spoon for your hands when needed. Remove dough from the food processor onto a floured surface and knead for 5 minutes, dough should be smooth and not sticky. Dust with flour, cover, and let rest for 30 minutes. Bring a salted pot of water to a boil. To make pasta, divide the dough into 6 pieces and divide those pieces in half. Using a machine or a rolling pin, roll out the dough to a thin, yet manageable thickness (I use setting 4 on my Kitchen aid pasta roller). From there, cut (or using a pasta machine) cut the strips into fettuccine sized noodles. Cook pasta in 2 to 3 batches, roughly 5 minutes per batch. Pasta should float to the top and be tender. Remove and divide into two batches, saving one batch for later use. While pasta cooks (whether premade or homemade) heat olive oil in a large skillet over medium-low heat. Add the fennel and cook, stirring often, until tender, 8 to 10 minutes. Stir in the garlic and cook for another minute until garlic is fragrant. 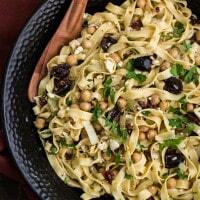 Add in chickpeas, olives, artichoke hearts, sun-dried tomatoes, zest and juice, parsley, and black pepper. Stir and cook until everything is warm, 2 to 3 minutes. Place 1/2 the homemade pasta (one of the batches you set aside) in a bowl. Top with the cooked vegetable mixture, followed by the feta. Finish with a nice drizzle (1/4 to 1/2 cup) olive oil. Toss until everything is combined. + I typically buy artichokes and sun-dried tomatoes that are not oil packed, but you can use either. If using sun-dried tomatoes that are dry packaged, be sure to let them soak in water until tender. + Toss the remaining half of the pasta with a bit of olive oil and save for later use, either with some marina sauce or another pasta dish. Alternatively, you could make half the amount of pasta- I’m just never good at halving eggs and I love leftovers. + Einkorn Pasta recipe from The Einkorn Cookbook by Shanna and Tim Mallon.